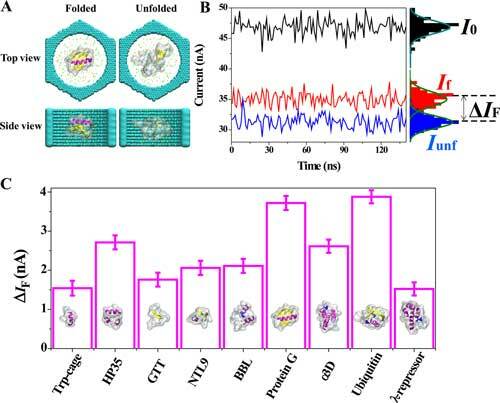 (Nanowerk News) In a recent paper in ACS Nano ("Nanopore Sensing of Protein Folding"), researchers report results of all-atom molecular dynamics (MD) simulations that directly evaluated the effect of protein folding on the nanopore ionic current. The team theoretically showns that measurements of nanopore ionic current can be used to monitor, in real time, folding-unfolding transitions of a protein and to characterize intermediate states along a protein folding pathway. 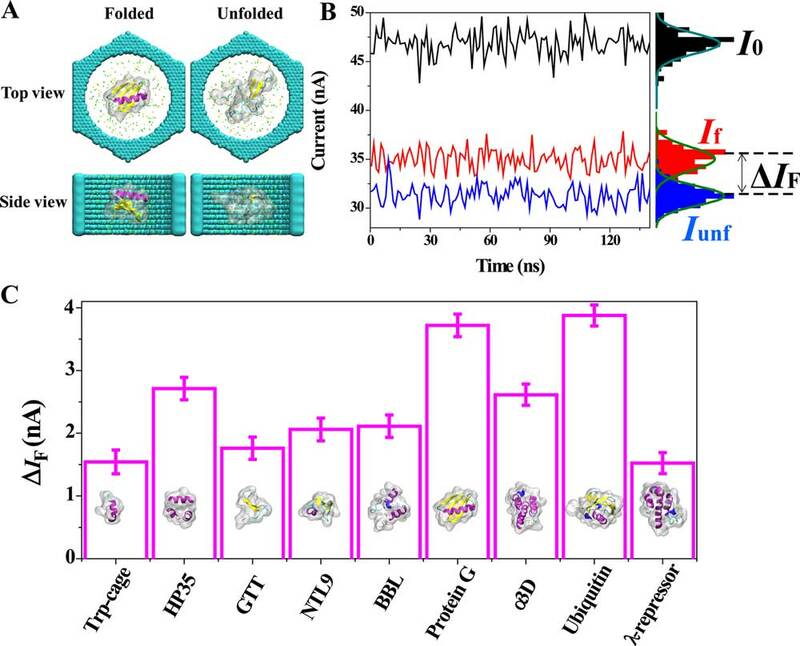 The experimental detection of protein folding can be realized by collecting ionic current signatures of many proteins transiently passing, one-by-one, through the nanopore volume. While offering high throughput, this approach, however, relies on statistical averaging over many protein translocation events, which eliminates some of the advantages of a single-molecule measurement. A much more attractive possibility, as the authors point out, is continuous monitoring of the ionic current through a nanopore that has a protein attached to its surface. Lipid-coated nanopore systems are particularly suitable for such measurements, as they can retain proteins within the nanopore volume long enough to detect a folding-unfolding transition in real time while allowing different copies of the proteins to enter and leave the nanopore. Decorated with metallic nanoantennas, plasmonic nanopores can be used to both rapidly change the temperature of a nanopore volume and to trap proteins, offering a single-molecule realization of a temperature jump experiment. By performing such ionic current measurements using nanopores of different sizes, one may be able to elucidate the effect of confinement on the protein folding process. "All of the above suggest that real-time monitoring of the protein folding-unfolding transition using an experimental nanopore system can be realized in the near future, leading to exciting developments in the area of molecular diagnostics and drug design," the scientists conclude their report.